Shortly after the holidays I had the opportunity to spend a week with some new friends in St. Augustine, Florida. I don’t think I have ever taken a “beach vacation” during the winter months before. It was truly wonderful…a much needed break and a delightful way to sort of brush the holidays out of my system for the year. We spent most of our time relaxing, walking along the beach collecting shells and, as is always the case with me when I travel, talking about and eating delicious food. 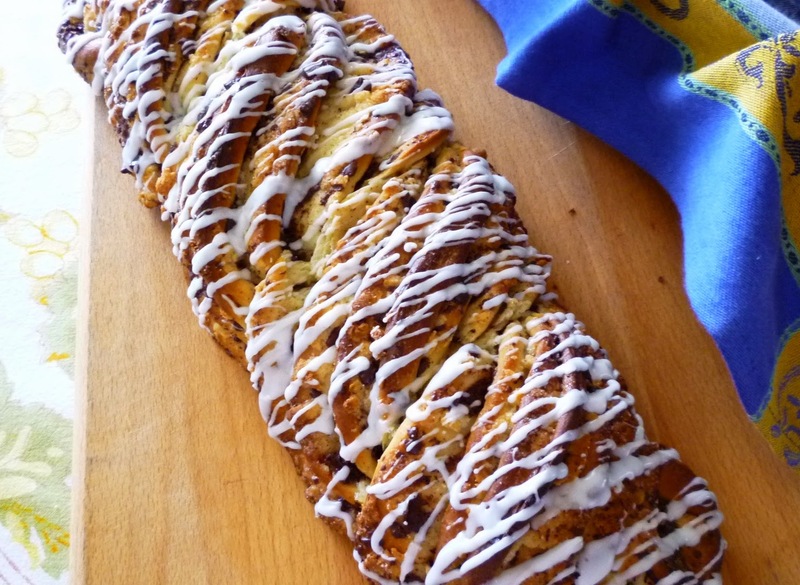 One morning I made a chocolate and almond tea bread for our breakfast. I made it with my favorite sweet roll dough. Because I have been making this dough since long before I began to cook professionally….and improvising with it for almost as long…it was an obvious thing for me to turn to while away from my home kitchen: Cooking in an unfamiliar space can be a challenge—choosing a familiar recipe stacks the deck in your favor. (In this case, one of my challenges was the lack of a rolling pin! A wine bottle turned out to be a handy substitute….) I filled the finished dough with almond paste and chocolate and then formed it into a layered twist (inspired by something I had seen on a group baking page on Facebook). We all thought it was beautiful….and delicious. Even so, since the dough for the loaf is identical to the dough I use for the holiday wreath coffee cake that I posted at the end of last year, I didn’t think I would bother to post the recipe. But yesterday, I made this bread again to take to a birthday brunch for a friend, and I was struck by how special it is…and really quite different from that holiday bread. So I have decided to post it after all. Part of what makes this loaf special is that it looks like it might have been difficult to make. But this isn’t the case at all. 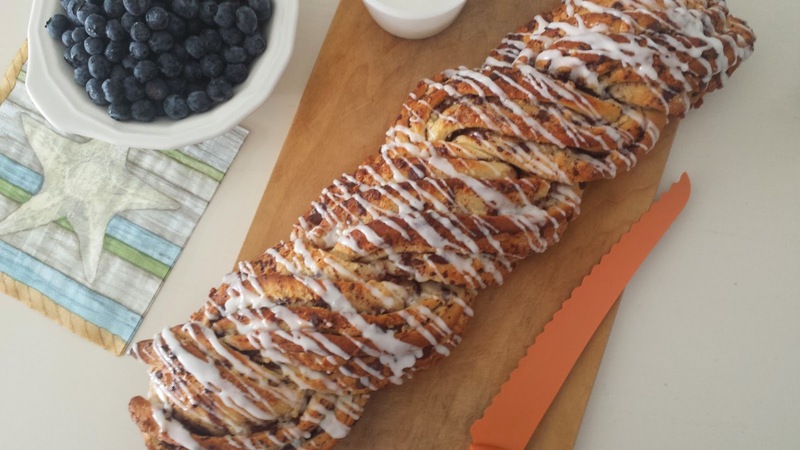 If you have made the wreath bread…or even cinnamon rolls, for that matter…making this loaf will not be a stretch. 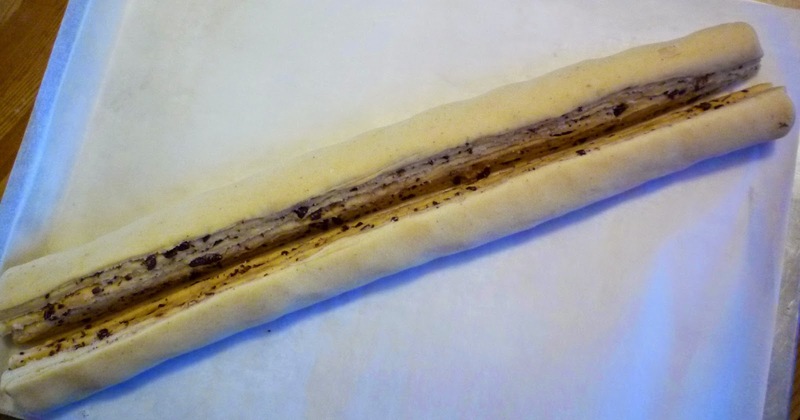 After forming the filled “jelly roll” of dough, instead of pinching it into a ring…or cutting it crosswise into rolls…just split the entire roll length wise. Then, twist the two pieces together, always being careful to keep the cut surfaces facing up. 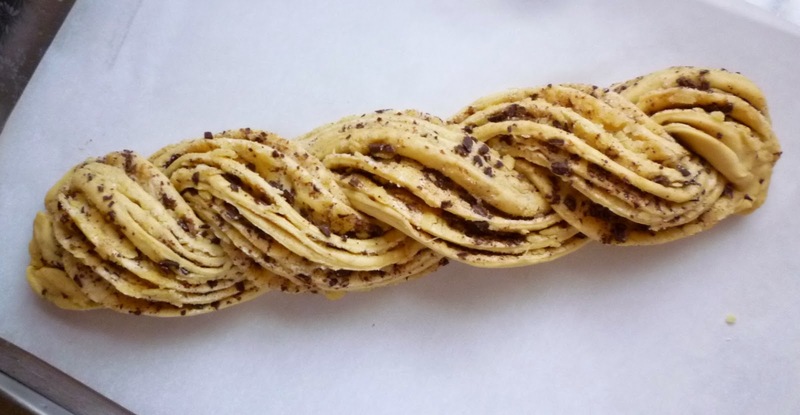 The layers of filled dough may want to fall open, but don’t worry too much about this…once they are twisted together, they hold together beautifully. Any filling that has fallen out can simply be tucked back in. In the end, I think it is instructive to see the versatility of this simple sweet dough. This is of course how professional bakers and successful bakeries operate. They rarely have basic component recipes that are only used in one way. Instead, they have a collection of well-tested recipes (for doughs, fillings, buttercreams, batters, sauces, etc.) that they use over and over again in a myriad of different ways so that they can efficiently and consistently produce a wide variety of delicious sweets and baked goods. As a home baker, you should follow suit. The secret of good cooks the world over is having a fistful of versatile recipes that you can make in your sleep…the little black dresses of your recipe file, so to speak. This dough happens to be one of mine. So someday…not necessarily anytime soon….I imagine I will post something else that makes use of this very nice dough. If you have made this bread….or the tea ring…I don’t think you will mind. Proof the yeast in the warm water. While the yeast is proofing, scald the milk. Remove the milk from the heat and add the butter. When the butter is melted, add the sugar and salt. Add the warm milk/sugar mixture to the proofed yeast and whisk to combine. Whisk in the egg. Add 1 c. of the flour along with the cinnamon and beat until smooth. Gradually add enough of the remaining flour to form a soft dough. Turn the dough out onto a lightly floured surface and knead until smooth and elastic (5 to 10 minutes). Place the dough in a buttered bowl. Turn the dough to coat with butter and cover the bowl with plastic wrap. Let the dough rise until doubled in bulk (about 1 ½ to 2 hours). Deflate the dough, cover and refrigerate overnight. In the morning, deflate the dough again. On a lightly floured surface, roll the dough out to a large thin rectangle (about 12-inches by 16- or 17-inches), making sure that the long side runs parallel to the edge of the work surface in front of you. 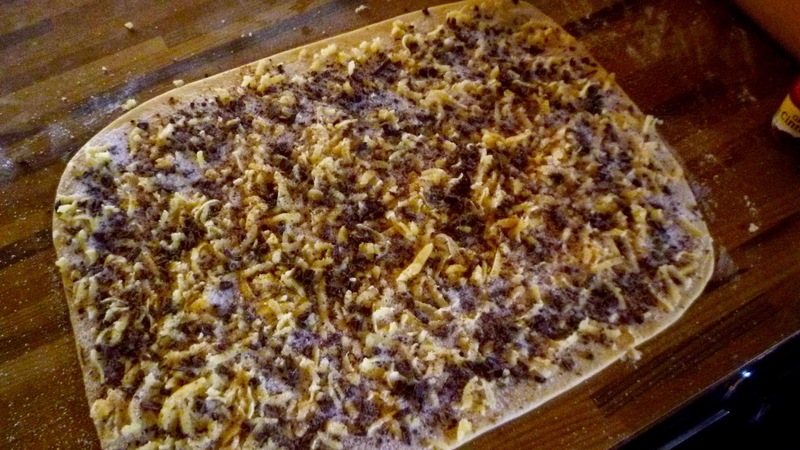 Brush the dough with 3 T. of melted butter, leaving a ½-inch strip of dough across the top bare. Grate the almond paste evenly over the buttered dough. Next, scatter the chocolate over the almond paste, followed by the sugar. Sprinkle some cinnamon (sparingly) over all. Starting with the edge nearest you, roll the dough up jellyroll-style, tightly. Pinch the final seam into the dough to seal. Turn the roll so that the seam is on the bottom. 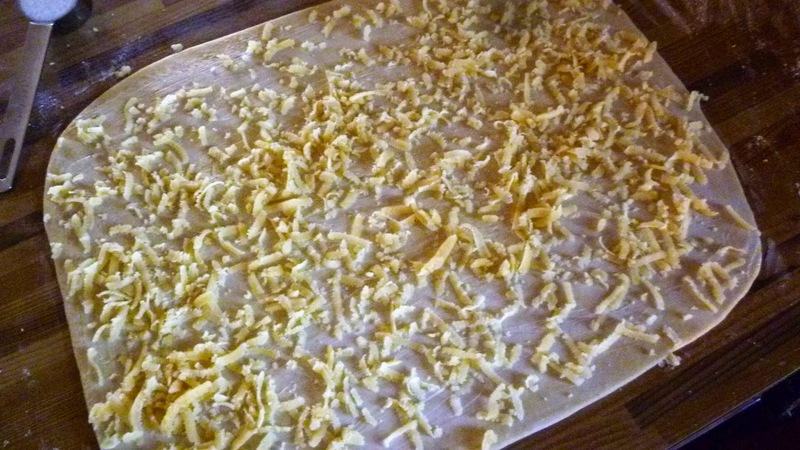 Place the roll on a parchment-lined baking sheet. Using a large sharp knife, cut the roll in half lengthwise. With the cut surfaces up, carefully twist the dough strands together (as if making a braid of two strands). Pinch the ends to seal. Cover loosely with plastic wrap and let rise in a warm place until doubled in bulk (about 45 minutes to an hour). Bake the ring in a 350° oven until puffed and golden brown—about 25 minutes (the internal temperature will be somewhere between 180° and 190°). Remove from the oven and slide onto a wire rack. Let cool for a few minutes. Drizzle with the powdered sugar icing. Serves 8 to 10. Powdered Sugar Icing: Mix 2/3 c. powdered sugar with 1 T. milk. Adjust the consistency as necessary with more powdered sugar or milk to form a thick glaze that drizzles slowly from a spoon. 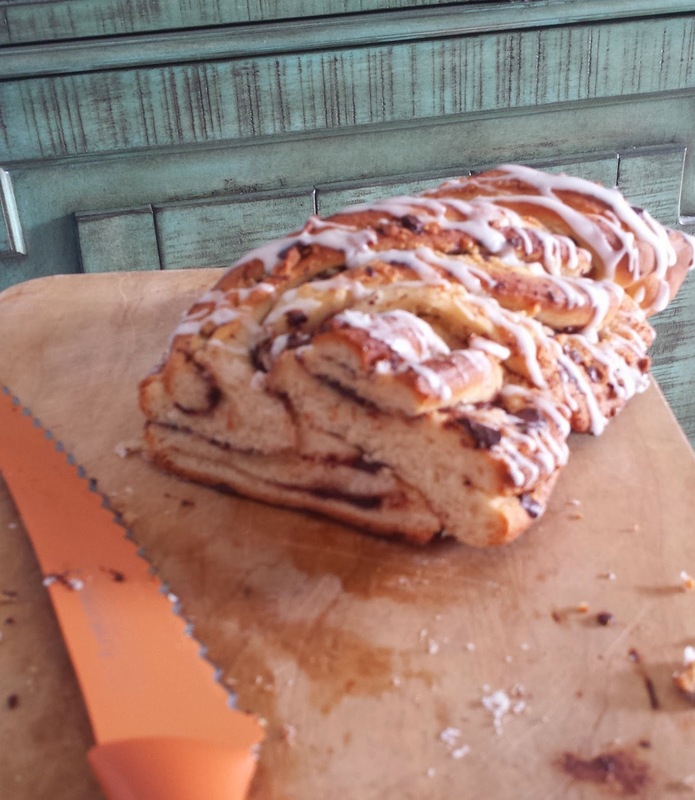 Hi Paige thank you very much for sharing this beautiful bread and showing how to achieve the lovely swirls. Awesome!